Historic Albany is proud of its roots, vintage architecture, and museums but it’s not “stuck in the past.” Known for having one of the largest collections of historic buildings in the state, this collection includes styles from the 1850s through the 1920s and is concentrated within an area of approximately one hundred square blocks. Four Albany Historic Districts are listed in the National Register of Historic Places. Albany is also home to an active community of preservationists who create intriguing exhibits for visitors of all ages. In the year 1847, James K. Polk was president, the United States was fighting the Mexican-American war, and two brothers from Albany, New York, Thomas and Walter Monteith, were making their way westward on the Oregon Trail. 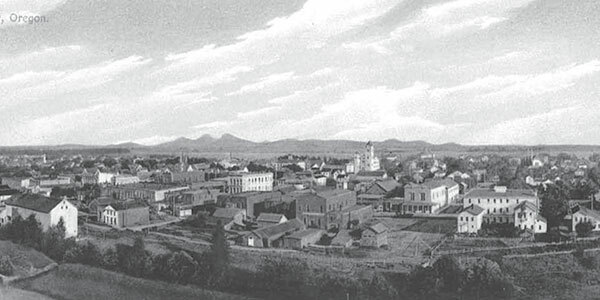 The brothers found an ideal spot near where the Calapooia River flowed into the Willamette, claimed and purchased their homestead for $400, then founded the town of Albany. They soon began building a house that straddled the line between their two homesteads, allowing each brother to sleep on his own land. It was completed in 1849 and was one of the first houses in Oregon to be built of sawed lumber instead of logs. Today, not only is the Monteith brothers’ house still standing, it’s been carefully restored to its 1849 condition and turned into the Monteith House Museum. Stepping off the wide front porch and into the parlor, visitors can see exactly what an 1860’s parlour would have looked like. Many of the furnishings are original to the house and were actually used by Thomas Monteith and his wife Christine. It’s said to be the most authentically-restored Pioneer Era home in Oregon, and is on the National Register of Historic Places. Albany residents are no strangers to nights of drama and passion. The city is home to one of the oldest and most active community theater companies in Oregon, as well as a summer performing arts festival and an independent local cinema. Nearly every weekend you’ll find a live performance or a thought-provoking film in downtown Albany. Dramatic productions have been a fixture in downtown Albany since 1951, when the curtains first went up on a series of one-act plays produced by the Albany Little Theater, now known as the Albany Civic Theater. Talented and devoted community actors, directors, and musicians have kept the non-profit group active ever since. ACT offers as many as ten productions a year of heart-tugging drama, family-friendly musicals and classic works by Shakespeare. Each is supported by volunteers passionate about bringing live theater to the Willamette Valley. On January 8, 1850, Albany’s first post office was established. The same year the Methodist church was founded. The Methodists were the first church group to be established in Linn County. By 1851 Albany was designated as the county seat and all court meetings were held here. 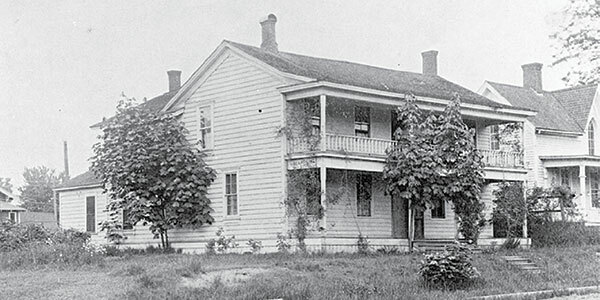 The first courthouse was built in 1852. Albany’s first school was established in 1851 by R.C. Hill, the town’s first physician. The first building erected for use as a school, however, wasn’t built until 1855 and stood at the corner of Fourth and Broadalbin streets. The Oregon Democrat was Albany’s first newspaper and was founded by Delazon Smith, who became one of Oregon’s first U.S. Senators. The newspaper is known today as the Albany Democrat-Herald. The first steamboat, the “Multnomah,” arrived in Albany in 1851. It had been built in New York City, shipped in pieces around Cape Horn, and reassembled in Oregon City. In 1870 a person could travel to Portland by steamboat for one dollar. In 1871 the first locomotive whistle was heard in Albany. The arrival of the first train was celebrated as the greatest event in Albany’s history. Albany businessmen raised $50,000 to ensure that the rails would come through their city, instead of bypassing it a few miles eastward. The train brought the farmers’ markets close as stagecoaches and steamboats gave way to the railroad. The world’s longest wooden railroad drawbridge was built in 1888 for the Albany-Corvallis run. By 1910, 28 passenger trains departed daily from Albany going in five different directions. 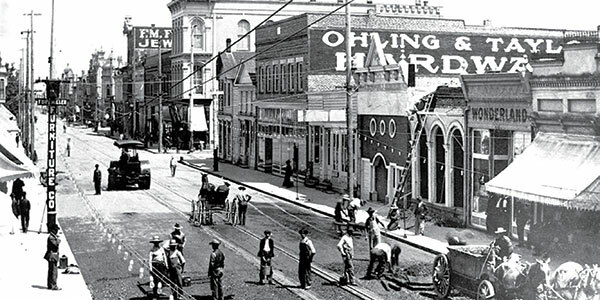 Today historians and architects credit Albany with having the most varied collection of historic buildings in Oregon. You can explore Albany’s Historic Districts by foot, bicycle, automobile, or organized tours. As you do, try to imagine the slower, quieter pace of days gone by. We won’t blame you if you feel like you’ve gone back in time when you pull off the road and into historic Albany, Oregon. After all, this riverside town is home to more than 700 historic buildings, and its streets are lined with elaborate Victorian homes, cozy Craftsman bungalows, and soaring Gothic-spired churches, all in a walkable downtown area. Just outside of town, country roads beckon with covered bridges and scenic byways. But don’t let the historic beauty fool you – Albany is home to quirky local shops, a thriving summer music scene, and some of Oregon’s best farm-to-table dining. Don’t miss these Oregon gems on your next road trip. The Willamette Valley is full of fascinating stories from Oregon’s pioneer days. In Albany, visit the Monteith House, the most authentically-restored pioneer home in the state, and see what an 1840s-era home and general store looked like. Just south of town, stop at Thompson’s Mill State Heritage Site, where rangers will give you a personal tour of a still-working water-powered mill from the 1850s. Stop at the Albany Visitors Association building in downtown Albany and pick up a self-guided walking tour map of Albany’s Monteith, Hackleman and Downtown historic districts. You can walk or drive past homes and stores from every decade between the 1840s and the 1940s. 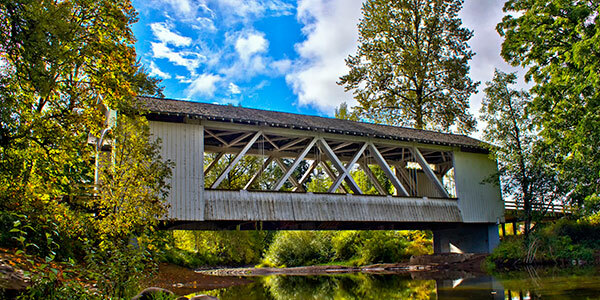 If you long to get out of town, explore the Covered Bridge Tour Route, which will take you through more than half a dozen of these peaceful reminders of Oregon’s pioneer past. If you want a more active trip, bring your bike along or rent one at Bike & Hike in downtown Albany – the Willamette Valley Scenic Bikeway runs right through Albany’s historic district and will take you past orchards, vineyards and views that you simply wouldn’t believe. Albany’s buildings may be historic, but its streets are brimming with food and drink innovation. At Sybaris Bistro on First Avenue, choose from an ever-changing menu inspired by Oregon’s seasons. For a more casual environment but equally delicious fare, head across the river to Frankie’s, where meals are sourced directly from Oregon’s farmers, fishers and foragers. Get a taste of Oregon’s booming craft beverage scene when you visit craft breweries, wineries and distilleries located both within the city and in the nearby countryside. Chocolate-lovers, don’t miss Victorian Chocolate Company in Lebanon, where master chocolatiers turn out hand-crafted confections using old-fashioned methods. Conveniently located near the major travel corridors and the Linn County Fair & Expo Center, both Blue Ox RV Park and Knox Butte RV Park offer peaceful settings and a full range of amenities for RV travelers.